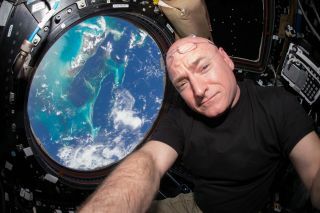 NASA astronaut Scott Kelly inside the International Space Station's cupola during his one-year mission aboard the orbiting lab. Former NASA astronaut Scott Kelly has been back on Earth for more than two months, but much of the science conducted during his unprecedented yearlong stay aboard the International Space Station (ISS) just landed. When SpaceX's robotic Dragon cargo spacecraft splashed down in the Pacific Ocean on May 11 after a month at the orbiting lab, it contained more than 1,000 samples of blood, saliva, urine and other biological material collected during the one-year mission, which Kelly performed with cosmonaut Mikhail Kornienko. It will take roughly 17 months for scientists to go through the entire data set, said John Charles, the chief scientist of NASA's Human Research Program. The results should help NASA and its international partners better prepare for crewed missions to Mars, agency officials have said. "You don't just do one [mission] because of biological variability," Charles told Space.com. "With the right astronaut or the wrong astronaut, the results back do not reflect the population, but that one person." The twins study includes 10 separate investigations focusing on four key areas: human physiology, behavioral health, microbiology and molecular studies. The investigations are a mix of science already going on at the ISS (which allows comparison to crewmembers' usual six-month missions) and unique studies for the one-year mission. What makes this set of investigations unique, however, is how closely the different teams will work together, Charles said. The experiments are a throwback to an earlier time; during Spacelab missions aboard the now-retired space shuttle, scientists would often coordinate investigations to make astronaut time more efficient. That was also the goal with the one-year mission, Charles said. "If we do more genomics-based studies — and I predict we will — we will have to apply the lessons we learned from this study to make them successful," Charles added. Charles said he has received many inquiries from impatient journalists wanting to see the science now, but he emphasized that his world is not like the TV shows "CSI: Crime Scene Investigation" or "Bones." Analyzing the data takes time, and there also is a need to figure out how the results will be published before they can be discussed. The challenge is the number of samples that need to be analyzed. Besides the 1,076 frozen samples returned from space, the Kelly twins also provided about a year's worth of samples before the mission. Furthermore, Charles said, samples will continue to be collected for six months after the end of the one-year jaunt, which ended with a March 2 landing. Investigators prefer to look at all the samples in "batch mode" — meaning at the same time — but it's possible that freezing the samples for a long time will change their structure. Discussions are ongoing about how to proceed, Charles said. While Charles and his colleagues are excited to see what they learn from the one-year mission samples, they're not discounting the results obtained during "normal" crewmember stints. "We believe there is a role for one-year missions," Charles said. "But we're also very happy with six months, because we continue to require lots of important information for human adaptation."